Just over a week ago, I wrote a post criticizing Fayetteville’s deal with Prince Charles Holdings for a parking deck beside our new baseball stadium. 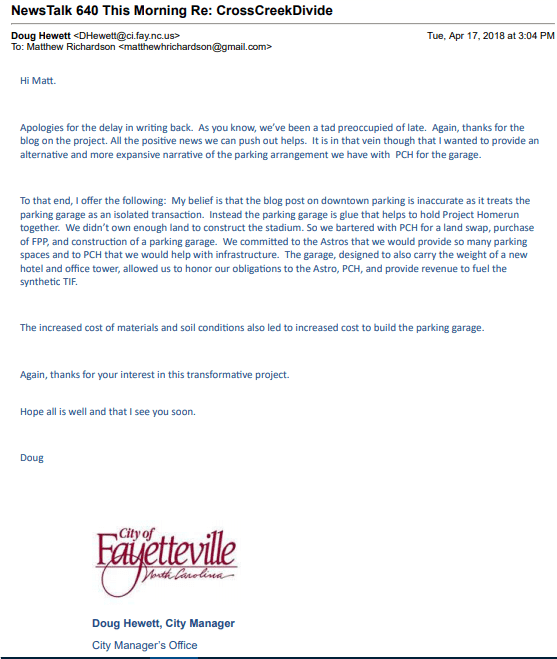 Shortly thereafter, Fayetteville City Manager Doug Hewett appeared on a local AM radio show and without stating my name or the name of this blog claimed the post was “inaccurate.” I reached out to Mr. Hewett in an email and offered to post any additional information he might have to correct the record. My belief is that the blog post on downtown parking is inaccurate as it treats the parking garage as an isolated transaction. Instead the parking garage is glue that helps to hold Project Homerun together. We didn’t own enough land to construct the stadium. So we bartered with PCH for a land swap, purchase of FPP, and construction of a parking garage. We committed to the Astros that we would provide so many parking spaces and to PCH that we would help with infrastructure. The garage, designed to also carry the weight of a new hotel and office tower, allowed us to honor our obligations to the Astro, PCH, and provide revenue to fuel the synthetic TIF. The increased cost of materials and soil conditions also led to increased cost to build the parking garage. My post discusses the number parking spaces available for public use, discounted private leases, and the cost of seemingly unfair “development fees.” Mr. Hewett’s email talks about synthetic tax increment financing (synthetic TIF) and land-swaps. I attached specific terms from Fayetteville’s contract with PCH to support my claims. Hewett implies that we shouldn’t get in the weeds and focus on the particulars of the parking garage contract because the garage is just a small piece of a larger deal, or “the glue,” as he puts it, that holds it all together. Before I go any further let me be clear: I want our downtown and our new stadium to succeed. I’m now the co-owner of a downtown commercial building where I practice law. I have two small boys, and I grew up going to Generals games at Riddle Stadium. Minor league baseball is a near-perfect family activity and a good fit for this community. However, our city leaders have made this about much more than than a baseball stadium. “Project Homerun” is a multi-million dollar wedding with a private development company. The “glue that helps to hold Project Homerun together” has already doubled in price in a few short months. That trend is likely to continue. If the project goes south, our new partners (and their multiple LLC’s) have a luxury that the city cannot afford: bankruptcy. We’ve already seen this play out with more than one public-private partnership downtown. This morning it was announced that the city will be charging people $10.00 to park downtown for this year’s Dogwood Festival. Apparently, they want to set a new standard for downtown parking rates. Remember that PCH will get to use 72% of the spaces in the city’s new parking deck for four years at $1.66 per day. Sound fair? Sound like the free market at work? 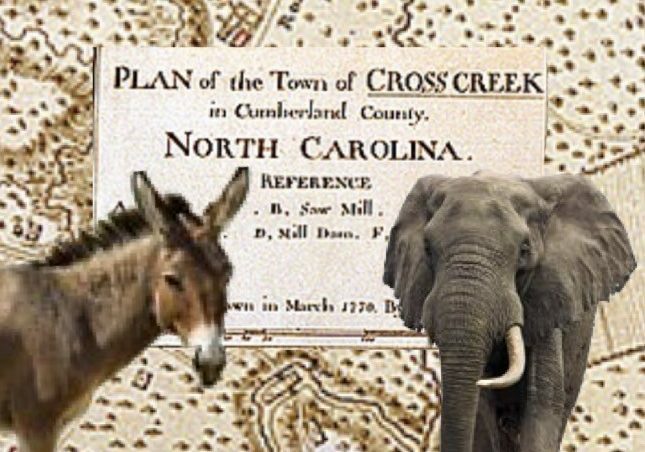 With that in mind, ask yourself whether the tax dollars being used to fund the city’s parking deck are being used for a public purpose under the North Carolina Constitution. Sound sticky? Glue often is, and we’re playing in a million dollar sandbox. Now you have both sides of an important debate. Let all of it sink in, do a little research, and make up your own mind. It’s your city.